Specialist representa­tion for employment law matters. for Personal Grievances­, Disciplina­ry Meetings, Unjustifie­d Terminatio­n, Constructi­ve Dismissal. Your personal advocate defending/pursuing your employment rights & financial compensation. Your support person for disciplinary meetings & mediation. Mostly Auckland, however we do travel anywhere in New Zealand when required. *Being called to a disciplinary meeting. *Being forced to resign from work (constructive dismissal) and wanting to do something about it. *Wrongful termination or written warning. *Help with a personal grievance. *Wanting to know their rights as an employee or an employer. *I am an employee and I have been called to a disciplinary meeting. What can I do? *I have been fired / sacked / terminated from my employment. What can I do? *What is the process for taking a Personal Grievance? *There are issues in the work place that I would like addressed to improve a working relationship or working environment. *I have been made redundant. What can I do? 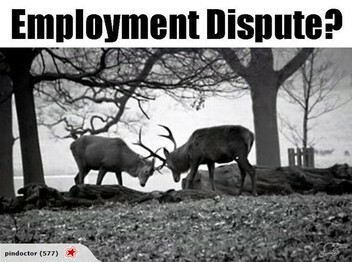 Please note that we are a dispute resolution business that specializes in Employment law issues. We are not a general law firm or lawyers. Under section 236 of the Employment Relations Act 2000 we are legally able to assist employees and employers in employment problems with general consultancy, representation at mediation, the Employment Relations Authority and the Employment Court. Thank you Danny for helping out with my dispute with the employer. Highly recommend! Danny was very professional and easy to deal with. He streamlined the process for me, and I had a satisfactory result. Hi Danny, I'd like to take a few moments to express my gratitude for all your help with my situation. You were a beacon of hope in a dark and depressing time. Your professionalism, knowledge and care was like a rife raft when my life was sinking around me. Thank you Danny, for without you I would have surely drowned. Thank you Danny, excellent knowledge and helped out in a difficult situation. Highly recommend! Thanks Danny for helping out in a difficult situation. Your help and guidance certainly reduced the stress and made things easier to deal with. Great to have the opportunity to review your service. It seemed to me that you had a standard letter for everyone which said I had a winnable case and therefore would not be charged for service without a win. It turns out that once the company made it clear they were not going to budge and we would need to go to the next stage - all bets were off. I would have to pay for any further action. I got a resolution but don't think it was an honest transaction. Danny Gelb: It's unfortunate that some employers would much rather pay their lawyers to defend a case in court as opposed to settling it at a realistic value. When this happens you either have to take the offer on the table, irrespective of how small it is, or find the money to fight it in court with no guarantees of a positive outcome. As they say a bird in the hand is worth two in the bush. You got your bird in the hand. Your negative feedback should be directed at your former employer, not towards us. Thank you Danny for your knowledge and expertise, and helping me "keep it together", and the best outcome for me under such challenging circumstances. Most especially, thanks for sharing your wisdom, and the lesson learned: "put it in writing". Thank you Danny for representing me, and getting a great outcome. Call a expert like Danny if and when the need arises! Danny was professional and represented us well. I would recommend him and would definitely use his services again should the need arise. Danny is incredible, handled our case with the utmost professionalism, and was completely committed to getting the best outcome. He always had time for us, and I felt very safe being represented by him.